I am on a software project which has about 10 developers, we share source code via Mercurial. We have a development and production branch per release. Repeatedly during the course of the project we have had source code from one branch i.e. v1 getting into patch and maintenance branches for earlier releases of software i.e. v2. This results in either time spent backing out the wrong commit, or wrong (possibly non-QAd) code reaching and getting deployed in the wrong branch if we don't notice that the code has gone into the wrong branch. Hence we will work on a release development branch, until it's deemed ready, branch it off for a single testing/UAT/Production branch, where all releases and maintenance is done. Tags are used to build releases of this branch. While v1 is being tested, a branch will have been made for v2 and developers will start working on new features. What tends to happen is that a developer commits work due for v2-dev branch into v1-dev or v1-prod, or worse, they merge v2-dev into v1-prod (or similar such mistakes). We tell most developers not to access the -prod branches, however code still sneaks in. A group of more senior developers `look after' the -prod branch. It should be noted that while v2 has just started development, there may still be some quite hefty patches going into v1 to fix issues. I.e. v1 may not just be getting the odd small patch. Having a separate -prod branch, with gatekeepers. A -prod branch should raise warnings through its name and most developers don't need to ever be in that branch. This has not really reduced the problem. Raised awareness of this problem amongst the developers, to try and make them more vigilant. Again this has not been very successful. I've read this question on not committing to the wrong branch and I feel that the answers regarding visual cues may be helpful. However I am not entirely convinced that the problems we're experiencing are not symptoms of a more fundamental problem. With the visual clues, we can incorporate them into the command line easily, however about half the team use eclipse which I'm unsure how to incorporate visual cues. What methods, in the form of software, project management or governance can we use to reduce (ideally stop) commits to the wrong branch taking up our time or dirtying our deployed code? Specific comment on the reasons I believe may be contributing as outlined above would be appreciated, but this shouldn't limit your reply. The problem is you are changing what the meaning of a branch is part way through the process. Initially, the v1 dev branch is for development. All new features go there. At some point in the future, it becomes a maintenance branch for the v1 release branch. This is the crux of the problem. Its not that the developers are sloppy, its that the permissions and roles of the branch are sloppy and subject to change. What you need to do is establish what role each branch as, and maintain that role. If the role changes, branch. In this model, developers always commit to dev. If you are building a patch, you check the patch into that release's branch (or better yet, branch the release branch for a patch and then merge it back into the release branch). One article that you should read (and its probably an understatement for 'should') is Advanced SCM Branching Strategies by Stephen Vance. In this article, he identifies five roles that branches may have. Sometimes a branch may fill two roles and roles do not necessarily need a new branch as long as the role policies do not change mid branch (you will occasionally see mention of "branch on incompatible policy"). Mainline. This is where branches are made from. Always branching from the mainline makes merges easier since the two branches will have a common ancestor that isn't branch upon branch upon branches. Development. This is where developers check in code. One may have multiple development branches to isolate high risk changes from the ones that are routine and mundane. Maintenance. Bug fixes on an existing production environment. Accumulation. When merging two branches, one may not want to risk destabilizing the mainline. So branch the mainline, merge the branches into the accumulator and merge back to the mainline once things are settled. Packaging. Packaging a release happens in the packaging branches. This often becomes the release and serves to isolate the release effort from development. See How to deal with undesired commits that break long-running release builds? for an example of where the packaging conflicts with development. In your example, you've got a cascading mainline (this is a problem - it makes merges more difficult - what happens if you want to merge a fix for v1 into v2 and v3? ), a dev branch that becomes a maintenance branch (change of policy, this is a problem). Ok, you say, thats great, but this was written for perforce which is a centralized VCS - I'm using DVCS. 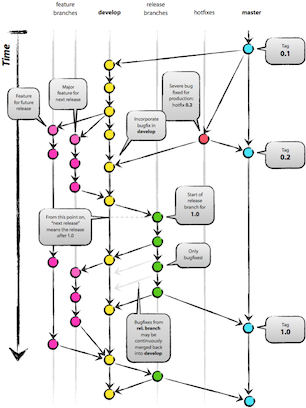 Lets look at the git-flow model and see how it applies. The master branch (blue) is the release branch - for tagging. It is not the mainline. The mainline is actually the develop branch (yellow). The release branches (green) are the packaging role. Low risk development happens in the mainline, high risk development happens in the feature branches (pink). In this model, accumulation is done in the develop branch. Maintenance are considered 'hot fixes' which are red. While the role policies aren't exact match (each product has its own slightly different lifecycle), they are a match. Doing this should simplify your branching policy and make it easier for everyone involved. While you have tried using a separate -prod branch with gatekeepers, it sounds as though the one repository is used to actually do the production builds. If the production builds were only done from a production repository, writable only by it's gatekeeper then the devs wouldn't be able to push to it. This puts a load on the gatekeeper, who would only push to the production repo after review. Of course people would still be able to pull from the production repo when needed. As people gain experience, they should be rotated through the gatekeeper role, to gain the deeper understanding or care that they seem to lack. And as a general rule, apply Occam's Razor: the entire repo structure should as simple as possible to do it's job. It's possible that the devs simply don't get DVCS well enough, but I think it's far more likely that you've simply got too much going on, and the devs can't keep track of what they are doing from moment to moment. They forget what branch they are supposed to be working in, and their changes end up in the wrong place. I'd suggest that you've got a problem with the fact that everyone is working in all of these branches on a regular basis. @andy256's suggestion of a separate repository for prod would certainly help, but you might need to consider parceling out the work differently, or perhaps arranging things so that no dev is working on more than one branch in a given week. This looks like you have identified one of my major bug bears. The majority of source control tools are exactly that, source control tools. They allow a bunch of developers to work on the same source directory, making changes and handling conflicts. There have been a few rough edges along the way, but cvs, subversion, git, mercural etc all deliver on this. Then you have the next step, when you need to stabilise code for release, and you introduce branching. This is where the tools start to fail the developers. The tools are capable at making the branch, and even identifying the sets of changes that have accrued on the branches after they have been branched, but that's not the problem you have now faced. The tools are really poor at selecting which changes need to be copied to other branches, and when that needs to occur. Git-flow attempts to solve this by creating a branching strategy that means that when branches are merged, its ALL changes are merged, and then requires the programmer to make sensible choices about when and which branches are merged. On a single repository where all the developers are working on one project that has a single release thread, git flow solves the problem, but life is not that simple for many companies. The complex environment is where you have multiple teams responsible for different aspects of the total solution, performing internal releases to other teams. git-flow is just not capable of solving this kind of issue. The only way I have seen this work, is if each team is responsible for defining their releases, and controlling when their dependencies change. Just because team A have released release 1.3, team B only start using team A's 1.3 release when team B chooses. In effect a team of developers define the groups of changes that need to be moved, and the developers receiving the changes define when they receive the group of changes. Not the answer you're looking for? Browse other questions tagged version-control training dvcs or ask your own question. How do you avoid working on the wrong branch? How to refactor when all your development is on branches? How to deal with undesired commits that break long-running release builds? How to use Subversion in conjunction with DTAP with several Scrum teams? How big should a single commit be? Does cherry-pick just pull changes into the current working tree as uncommitted changes? Do we need to create local branches for the enhancements we are working on? When do I update the Git repo package.json/version release? What advantages in source code control are there to a three-stage environment repository?